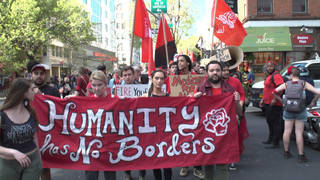 Immigrant Workers Lead Thousands in NYC May Day Protests: “Without Our Labor, the City Cannot Move” | Democracy Now! ARMANDO GIRÓN: [translated] My name is Armando Girón, and I’ve been working at B&H for nine years now. We are very concerned, because the company wants to move to New Jersey, and the majority of my co-workers and I live here in New York—in the Bronx, Queens and in Brooklyn. AGUNDA OKEYO: Hi. My name is Agunda Okeyo. I’m a native New Yorker, originally from Kenya. I’m an immigrant. I’m an activist, an organizer, and I’m coming here with my friends, who—we’ve co-founded a campaign called Hater Free NYC. It’s a localized, creative action boycott targeting the current Trump administration, including the Cabinet. Think of this as a day where people can come together and recognize the history of America in a more honest sense and the fact that workers’ rights are in everyone’s interest. ANH TRAN: My name is Anh Tran. I teach at Baruch College. I’m here at May Day supporting CUNY adjuncts. Adjuncts are part-time workers in they CUNY system. We’re faculty who teach—it actually could be full-time teaching, but we get paid as part-time workers. And so, we are severely exploited in terms of not being able to know whether we’ll have a job from semester to semester. You can see how impossible it is to plan, you know, paying your rent, if you don’t know whether you’re going to have a job the next semester.